Collaborations among those from widely dissimilar fields of the creative arts are nothing new, but some are more interesting than others. Perusing the arts blog at the New York Times over the weekend, I saw a piece about the French street artist named JR, whose talents are now to be tested in a quite different arena, namely as choreographer of a new production for the New York City Ballet that will debut as part of the company’s spring season beginning in April. 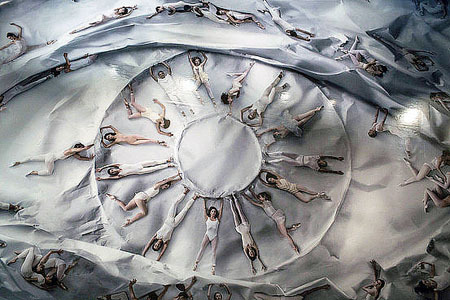 It’s all a result of a remarkable installation by JR that was on view at the NYCB’s home base of the David H. Koch Theater from January 26 through February 9. Shown above (as seen from an upper ring of the theater), it consisted of a 6,500-square-foot vinyl photograph of dozens of life-sized dancers that covered almost the entire marble floor of the venue’s promenade space. Before long, smartphones were ubiquitously employed by many who had their picture taken as they lay down alongside their imaginary dance partners, elevating the mural to viral status. As I got further into the story, I came across Lil Buck (real name Charles Riley), who practices what’s called “jookin” and who will be featured in the upcoming dance creation by JR. “Jookin” is a variety of technically challenging hip-hop dancing that’s led to Lil Buck being called a “Baryshnikov” of the genre by the Times. 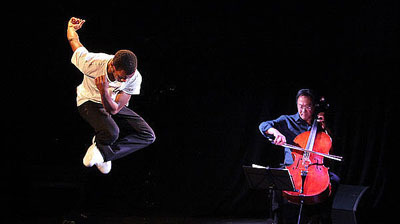 A 2011 video of Lil Buck performing a startlingly unique interpretation of Saint-Saëns’ “The Swan,” with Yo-Yo Ma on the cello, taken in an informal setting by the director Spike Jonze on his iPhone, has since received more than two million views on YouTube. (The photo above is from a 2013 performance.) Supple and subtle, contortional yet often delicate, Lil Buck’s rendition is another example of art reshaped into something fresh and wondrously new. Street art, ballet, jookin, classical music…and artists with names like JR, Yo-Yo, and Lil Buck. That’s some creative converging all right. There’s the old saying, attributed to General Douglas MacArthur, that “Old soldiers never die, they just fade away.” In the world of ballet, you can substitute “dancers” for “soldiers” and “pirouette” for “fade” and it’s just as true. Last night’s Career Transition For Dancers annual gala, held in New York City, with a scheduled appearance by the former Russian étoile Natalia Makarova, brought home that very point. Having witnessed her at the summit of her career, in what many call a “Golden Era” of ballet in the late ’70s and early ’80s, I realized I hadn’t thought about Makarova in years. 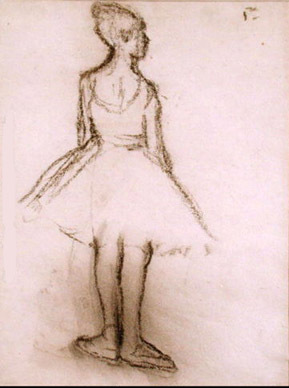 And then I recalled some of her colleagues then also at the peak of their fame, like the American ballerinas Cynthia Gregory and the once-wunderkind Gelsey Kirkland, and wondered…what happened to them? Of performing artists, ballet dancers have the most limited time in the spotlight. Unlike opera singers, for example, who are allowed to grow older (and heavier) but whose voices continue to thrive, dancers face the toughest of careers, longevity compromised by the reality of finite physical endurance. Compounding the irony is the fact that artistic maturity finally catches up when the legs don’t have as much left to give. A poignant reminder of the fickleness of this most beautiful yet treacherous of avocations is the sad end of the legendary Margot Fonteyn, who died (in dire financial straits) at a hospital in Panama in 1991. Laid to rest in a pauper’s grave, it was a tragically unfit closing act for the great — some consider greatest — ballerina of the 20th Century; one would think she could have been accorded a less ignominious goodbye as a Dame of the British Empire. (Sic transit toe shoes, so to speak.) Her equally illustrious partner, Rudolf Nureyev, fared better, stylishly buried at a Russian cemetery in Sainte-Geneviève-des-Bois near Paris, in a tomb draped in a mosaic of oriental carpet. There are some exceptions to the fade-away rule: Mikhail Baryshnikov, of course, who went on to other endeavors after ballet superstardom, via work with modern-dance troupes and the eventual creation of the Baryshnikov Arts Center, as well as appearances in movies and on television. In Miami, New York City Ballet alumnus Edward Villella forged a world-class ballet company which magnificently carries on the traditions of his mentor, choreographer George Balanchine. But exceptions they are. Fortunately, an organization like Career Transition, founded in 1985, recognizes the special needs of those less famous, and helps to assist in that difficult grand jeté to a post-performance life. The evolution of the Miami City Ballet into the world-class company on display in its current season-ending production of Romeo & Juliet (left) has been wondrous to behold for local dance fans who have witnessed the troupe’s artistic growth first-hand since its beginnings 25 years (!) ago. It also reminds that there are certain ballets, and Romeo & Juliet is one of them, where you must clear your mind of things come before as you approach any new performance. 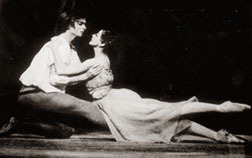 For many balletomanes, Margot Fonteyn and Rudolph Nureyev (below) are unmatched in the title roles, familiar to most from the 1966 film with England’s Royal Ballet. 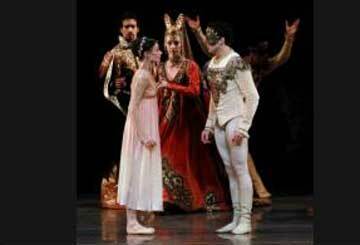 (Much later, Italian ballerina assoluta Alessandra Ferri and partners including Julio Bocca.) But not to digress into a discussion of dancers too much; MCB’s choice of the John Cranko choreography for the story of the doomed Shakespearean lovers is an interesting one. Being far more familiar with the Kenneth MacMillan version, I was struck by some differences between the two, especially in the key moments of the “balcony” pas de deux and the finale. Fonteyn’s joyful run down the steps for her encounter with Romeo in the balcony scene is not easily erase d from memory; there’s no staircase in the Cranko rendition, however, as his choreography has Romeo bringing Juliet gently down from the loggia above. Likewise, Cranko’s interpretation of the final act in the burial crypt is minimalistically subdued compared to the hammier MacMillan counterpart (but as far as dramatic impact, MacMillan has the edge). Romeo’s choice of suicide (dagger or poison?) also varies; the former in Cranko, the latter in MacMillan. The one constant: a glorious Prokofiev score. Anyway, what’s wonderful, as in anything related to the arts, is discovery and fresh analysis just when you think you’ve got something covered. The marvelous little gem of a documentary, Every Little Step (2009), is a behind-the-scenes look at the casting for the revival of A Chorus Line on Broadway in 2006. (This year marks the 35th anniversary of the show’s debut). More importantly, it’s a tribute to the visionary choreographer Michael Bennett, and how he planted the seeds for what became the longest running show in Broadway history at the time. It’s worth watching for Jason Tam’s highly moving audition for the role of Paul, with the monologue that won Sammy Williams a Tony in 1976; original footage of a stunningly sinewy Donna McKechnie as Cassie, dancing to “The Music and the Mirror”; and her successor in the revival, Charlotte D’Amboise, daughter of champion of dance (and New York City Ballet alumnus) Jacques D’Amboise, sharing some moments with her aged dad that are touching reminders of passing the torch. Though the final production apparently did not live up to the original, this film (currently on Encore) is an illuminating portrait of the often harsh vicissitudes that constitute a dancer’s life.